Today, Sunday, is Day 2 of the MegGoesNomNom self-declared SPICE WEEK. 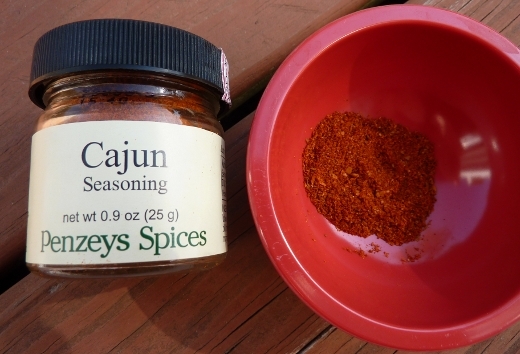 Next on deck – Cajun Seasoning! This seasoning is an irresistible blend of a plethora of various spices: paprika, salt, celery, sugar, garlic, black pepper, onion, oregano, red pepper, caraway, dill, turmeric, cumin, bay, mace, cardamom, basil, marjoram, rosemary, and thyme. Phew! The plan I had for the Cajun Seasoning was to make a chowder, inspired by the one shown below, which I enjoyed on Friday night at Carlyle Grill, photographed with my iPhone. 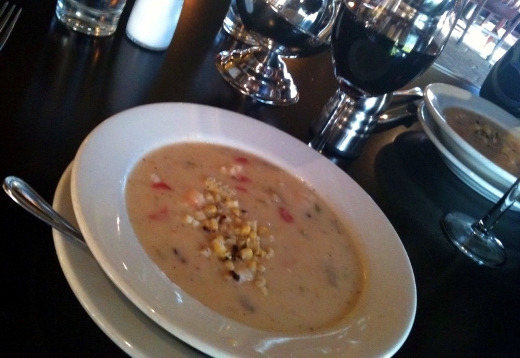 Carlyle’s version is a Rock Shrimp & Corn Chowder. 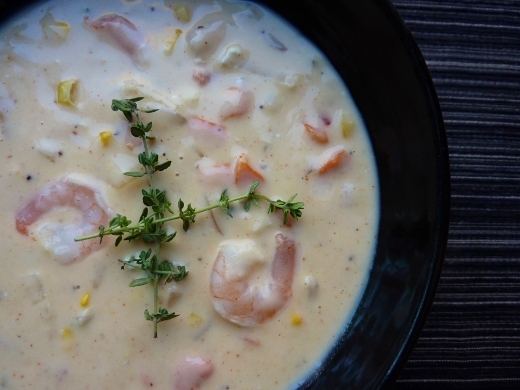 The smoky grilled corn, sweet lumps of shrimp, and creamy base work together so well – love this soup! 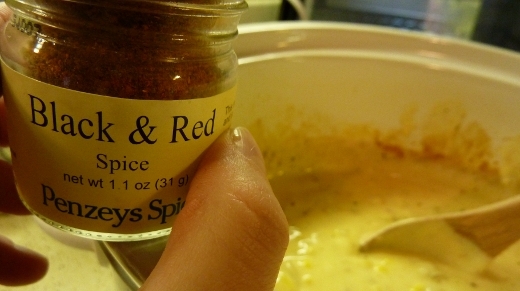 While I didn’t have Carlyle’s recipe to use, I found a recipe which sounded good on the Taste of Home website, for Shrimp Corn Chowder. It was easy enough. 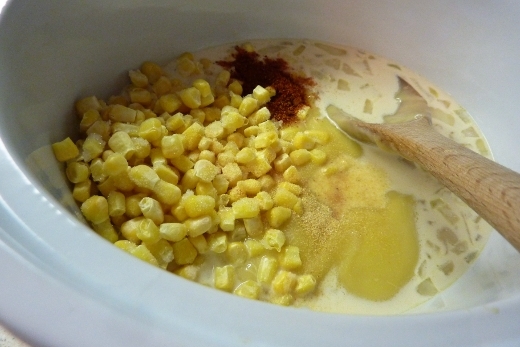 Start by combining evaporated milk, cream of potato soup, cream of chicken soup, frozen corn, garlic powder, and Cajun seasoning in a crock pot. (I cut the recipe in half, for two people). 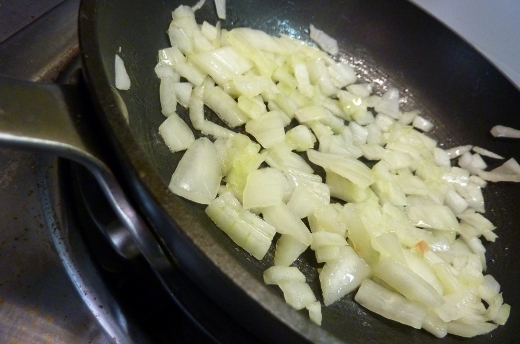 To the crock pot, I also added in about 1/2 cup of onions sautéed in butter until soft. The crock pot was then left on low for just under three hours. I did gently stir this soup from time to time, as I was concerned about the cream-based soups burning – but they did not. Toward the end of the three hours, I tasted the soup, and it seemed to be lacking a punch. I thought this might be a good time to bust out my new Black & Red Spice – a blend of bold Tellicherry black pepper and hot cayenne red pepper. Since the cream-base was feeling a little one-note to me, I randomly threw in a few extras to add a little texture to the soup – a small amount of leftover finely chopped jalapeno, red onion and tomato (from yesterday’s guacamole endeavor), as well about 1/2 cup of chopped carrot that I steamed for about 10 minutes before adding to the soup. After three hours in the crock pot on low, I added in 1/2 lb of small shrimp (frozen, pre-cleaned, thawed), as well as 3 ounces of cream cheese. I let the cream cheese and shrimp heat through for about 20 minutes, and then it was time to NOM. 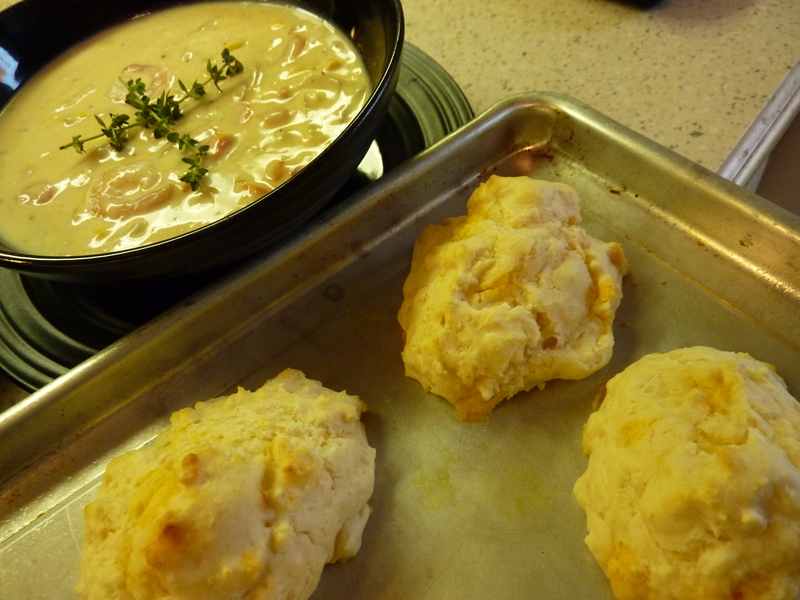 The chowder was enjoyed with garlic cheddar biscuits (half of a bagged mix – made enough for T and I to each have two). I had measured out one bowl for myself, which was around 250-300 calories. Not too shabby! I have never cooked with shrimp prior to today! In fact, I used to dislike shrimp until recently. I am excited of the prospect of a new, tasty, low-calorie, healthy, easy protein to cook with in the future. The soup was tasty! 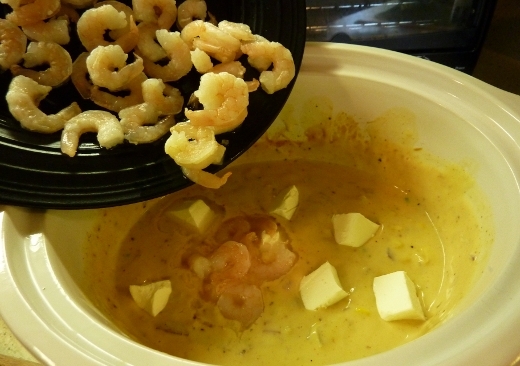 I liked the sweet corn and shrimp paired with the spicy Cajun Seasoning and creamy base. It was very thick and rich though, but as Tom said, that’s why it’s called “chowder” I guess. Tasty, tasty! ♪♫ Currently listening to: Slow Poison – The Bravery. Pingback: Spice Week – Day 2: Part II – Guinness Banana Nut and Ginger Bread with Dates « Meg.Goes.Nom.Nom.